Healthy teeth make for an attractive smile, but did you know a healthy mouth may also protect your hearing? While it might be difficult to understand how good oral health can prevent hearing loss, think of it this way: harmful bacteria that develops in your mouth as a result of bad oral health can enter your bloodstream and cause inflammation and narrowing of arteries and blood vessels – including those essential for hearing health in your ears and brain. important for your hearing, too. Your outer ear, also known as the pinna or auricle, collects sound and funnels it down the ear canal to the eardrum and then into the inner ear, where the sensory organs for hearing (cochlea) and balance are located. Once there, it stimulates a set of hair cells (stereocilia) which translates sound into electrical impulses and transmits them to the brain for interpretation via the auditory nerve. These hair cells can be damaged by a variety of factors including excessive noise exposure, medications that cause hearing loss and poor circulation to the small blood vessels in the inner ear. Once they are damaged, they cannot be regenerated, and you develop hearing loss. While this occurs naturally as we age, factors such as poor oral and dental health can speed the process along. Good hearing health relies on a rich supply of blood to the cochlea. Because circulation of blood is so important, good heart health is connected to good hearing. According to a publication from Harvard Medical School, a direct link between heart disease and oral health has been hard to establish, but researchers do acknowledge that poor oral health could lead to poor circulation. Dental infections and periodontal disease can lead to heart disease, heart attack and stroke. Bacteria from the mouth can result in overall body inflammation which can impede blood flow and form clots. See your dentist or hygienist every 6 months for a check-up and professional teeth cleaning. Brush your teeth enough: at least twice a day for 2 minutes each time. Select a toothbrush that is small enough to fit into the far crevices of your mouth and around back surfaces of teeth. Floss properly using an 18-inch length of floss so you can use a fresh section of floss every few teeth. Wrap the floss around each tooth and pull debris out. Don't share a toothbrush with anyone, even family! After brushing, rinse your brush and keep it uncovered to air dry. Change your brush every 3-4 months. 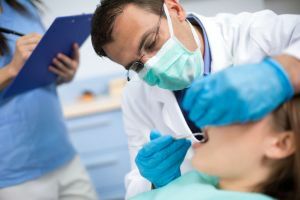 That poor oral health has a relationship with hearing loss is yet another example of how so many facets of our health are interconnected. Overall wellness will help you live longer and make those extra years full of vitality. If you suspect you have hearing loss, don't wait to seek help. Hearing loss is well-understood with very effective treatment options.